The rhesus macaques provide researchers with crucial insight into monkey behavior. 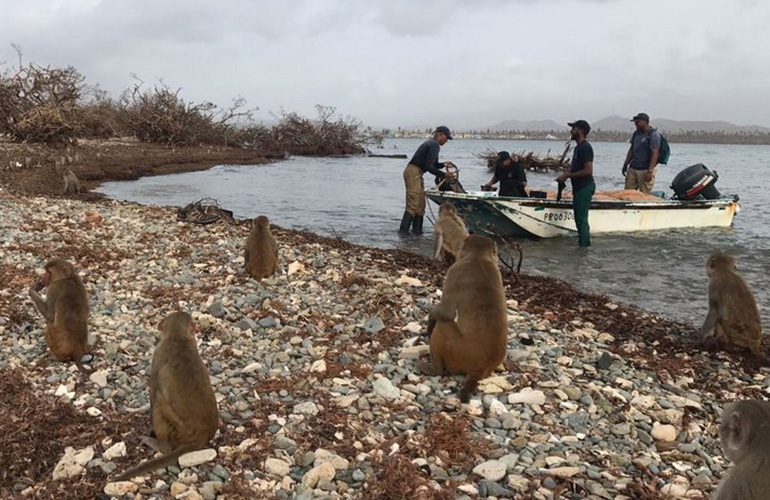 More than two weeks after Hurricane Maria made landfall on Puerto Rico, scientists are still scrambling to save the more than 1,000 rhesus monkeys that live on a small piece of land off the main island’s southeast coast. Cayo Santiago, known as “Monkey Island,” has been a crucial resource for researchers studying primate behavior, cognition and genetics since the 1930s, when scientists brought monkeys to the island from southeast Asia. Since then, a population of rhesus macaques has thrived there, offering scientists a window into the primates’ lives. An NPR profile of the island in 2015 characterized it as a monkey paradise, where human researchers ate their lunches in cages while the macaques roamed free. Miraculously, the monkeys largely survived the initial impact of Hurricane Maria. Alexandra Rosati, an assistant psychology professor at the University of Michgain, wrote at The Conversation about the joy and relief that researchers felt when they discovered a particularly beloved monkey had made it through the hurricane. But the storm devastated the small island, destroying its lush vegetation and wrecking the infrastructure that provided its inhabitants with fresh water, according to news releases from Yale University and the University of Michigan — two of several institutions now working to care for the monkeys. Noah Snyder Mackler, University of Michigan Aerial photos of Cayo Santiago before and after the storm. Researchers are now transporting shipments of food and water to the island, and working to rebuild the rainwater cisterns that the storm destroyed. They’re also distributing supplies and helping with rebuilding efforts in the local community in nearby Punta Santiago, a 15-minute boat ride from Monkey Island. Many of the staff who work on Monkey Island are residents of Punta Santiago.